When Gannon´s Restaurant opened in Hawaii on the island of Maui in November of 2009, diners were immediately enticed by its inviting ambience. 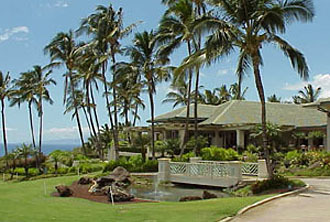 Several unique dining areas flow gently into each other and into the lush, tropical vistas that make up the Wailea coastline. The expansive interior, adorned with the bold, vivid paintings of renowned Maui artist Jan Kasprzycki, is complemented by white-washed oak tables and chairs upholstered in soft pastels. Majestic palms and island flora add to the lush, tropical feel of Gannon´s. The Grille Room is highlighted by two large murals painted by well-known Big Island artist, Arthur Johnson, both depicting the natural beauty of the scenery surrounding the restaurant. Large glass doors welcome in Maui's warm tradewinds. Stepping through the doors brings diners to the restaurant's lanai, where al fresco dining is enjoyed throughout the year. The lanai offers stunning views of the islands of Molokini and Kaho'olawe, as well as the rich green landscape that reaches up to Haleakala Crater. Spectacular sunsets light up the Maui skies each evening, and humpback whales are a familiar sight in the Maui waters throughout winter and spring. If you have up to 40 guests, consider the Upper Pond private reception site, with views of the gold course and lush scenic pond. 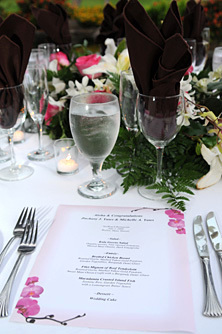 A setup fee of $344.00 includes the tables, chairs, silverware, linens, personalized menus and staff. If you are having 30 of fewer guests, you may book the Lower Pond site with a set up of $188.00. Personalized menus with the Bride & Grooms names and a selection of appertizer and entree items you have pre-chosen for them. 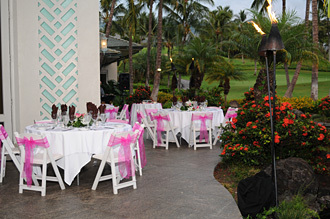 The beautiful Gannon´s Restaurant is located in sunny South Maui on the Wailea Gold and Emerald Golf Course. Surrounded by rolling hills of the golf course and spectacular sunset views. 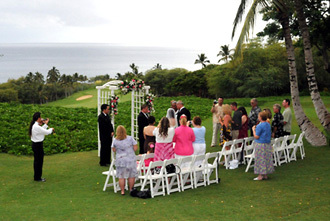 You may be married at a few private locations on the property for fees between $340.00 or $391.00 for the Lower Wedding Knoll, or $782.00 or $886.00 for the Molokini Lookout (depending if you are having a reception here or not) ranging from 0 to 100 guests (some restrictions apply). 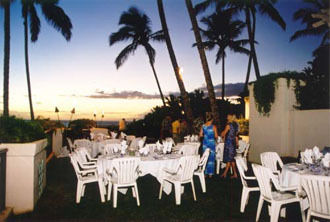 The Private Oceanview Lawn (pictured - up to 30 guests or more), located just steps away from your reception site is just $340.00, when having a reception at the restaurant, or $391.00 without having a reception, each will include up to 30 chairs (additional chairs are available at an additional cost). We can also arrange a decorated archway of your choice at an additional cost. 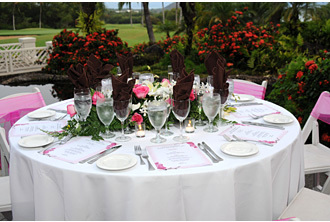 Your reception can take place at a number of private venus at the restaurant just steps away from the wedding site. A setup fee of between $188 - $620 includes your tables, chairs, silverware, white linens, personalized menus and staff for your group. The Lower Lawn (pictured) can accommodate up to 50 guests or more guests, set up fee is $594.00 for under 50 and $620.00 for over 50. We can also arrange a dance floor, dj or musicians for your dining and dancing pleasure.